“Deep Water” was composed by Hungarian-born Tin Pan Alley composer Jean Schwartz, with words by Canadian lyricist Alfred Bryan. The song employs an extended metaphor of shipwreck to describe emotional distress and a feeling of desperate loneliness. The singer complains of being submerged in deep seawater and asks for an oar, a lifeline, or, failing those, prayers or sympathy. Her plight would appear to be entirely figurative, her ailment psychological depression, not drowning; so it is funny that the refrain ends with the complaint “Deep water never drowns my troubles for me!” Here the expression “drown your sorrows” (which usually refers to resorting to alcohol) is invoked, and it clashes with the larger theme of drowning from depression. The overall effect of the song is thus a playful, rather than a genuinely depressing, one. 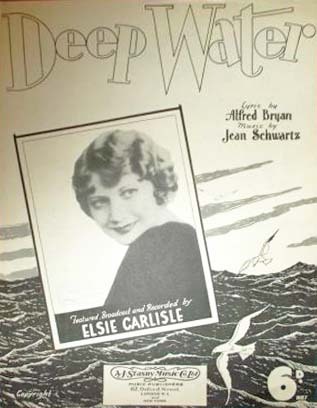 “Deep Water.” Music by Jean Schwartz, lyrics by Alfred Bryan (1931). Recorded by Elsie Carlisle on March 3, 1933. Decca F. 3507 mx. GB5629-1. This March recording of “Deep Water” is melancholy for its first few seconds but straightway becomes more upbeat. Elsie’s delivery of the song’s complaint is in every way fun and is complemented by a piano solo whose virtuosity drowns any idea that the song is meant to be depressing. 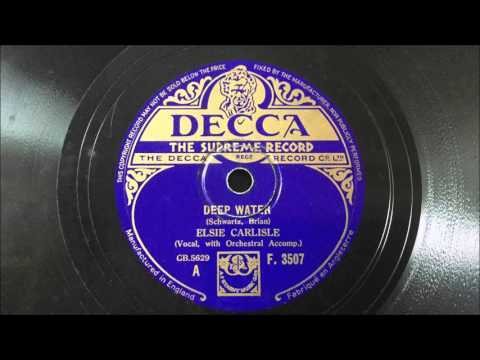 “Deep Water.” Recorded by Oscar Rabin and His Romany Band (as Brockman’s Band) with vocals by Elsie Carlisle on May 9, 1933. Plaza P 103 mx. L995-1. 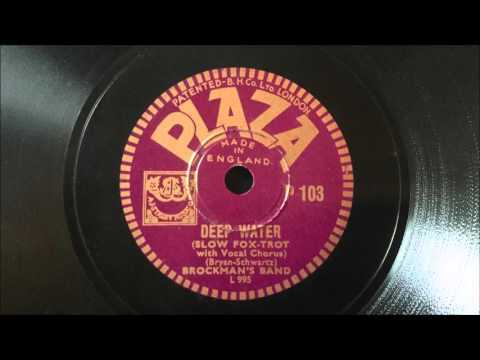 The only other contemporary recording of “Deep Water” would appear to be the one that Maurice Winnick and his band made on May 12, 1933, with vocals by Sam Browne.